The lucky winner, Ian Rowson was recently presented with his free membership from Magna Vitae's director of operations, Aeneas Richardson. 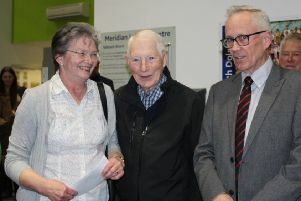 A man from North Somercotes has gone and bagged himself a free 12-month membership at The Meridian Leisure Centre in Louth after becoming the two millionth visitor to the facility. Since the leisure centre opened in February 2010, over two million people have passed through its doors. The figures show that they are double the usage target that was set for the meridian in 2009 prior to opening. Those from the leisure centre have said with that amount of people, you could fill up Wembley Stadium an incredible 22 times. The lucky winner, Ian Rowson was recently presented with his free membership from Magna Vitae’s director of operations, Aeneas Richardson. Mr Rowson commented; “I am very happy to receive this prize and thank you to Magna Vitae. “I visit the pool twice a week and have done since opening. I also used the old Louth pool before that.